Should I Bring Anything and What Do I Wear in the Float Tank? Birthday suit will provide the best experience, all of the float rooms at Easy Float feature a private shower and changing area, but you are absolutely welcome bring a swimsuit if you prefer. We also recommend bringing any hair products, deodorant, or anything else that you like to have after a shower. We provide Qtips, lotion, shampoo, body wash, conditioner, and hair dryers. What if I want to float longer? No problem! 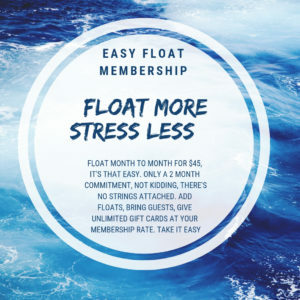 We are happy to provide extra time at a reasonable rate (see pricing) when there is not a scheduling conflict, but if you are looking for an extra-long float, like 2.5 or 3 hours, then simply schedule back to back sessions or we are happy to arrange a late night float with advanced notice. HOW DO I GET READY TO FLOAT? Avoid shaving, tanning, waxing; extra sensitive skin and salt water don’t mix. We provide Vaseline to protect small scratches from stinging. Try to skip caffeine for at least 4 hours before floating in order to access the most relaxing experience, but if you need that one small cup of joe in the morning, it will not totally unhinge the experience. Don’t float on an empty stomach. A light meal or snack is helpful so that you aren’t distracted by your stomach grumbling while floating. Allow a little time to digest before floating. If you are under the influence of drug or alcohol you will NOT be allowed to float. HAIR DYES: Please be sure your hair is running clear in the shower at home and not leaving any color residue on your towels. If your hair radical, like RED, Purple, Blue…then you must wait to float until your hair is running clear; otherwise, you are subject to a $500 cleaning fee is the float tank is left unusable by the next guest in standard operations. If you are experiencing your menstrual cycle the day of your float, then we ask that please reschedule your float. Thank you! OK, but how the heck do I get started? The process of actually floating. If you choose to wear ear plugs, and we recommend you do and we provide them, then put the ear plugs in before you shower. Take a great shower, but not a hot shower, you’re going into a float tank solution at about 95 degrees. Make sure to dry your face before getting in the tank! Enter the tank and gently lie back, avoid touching your face when your hands are wet; you will float effortlessly. The rest is really up to you. Enjoy a cup of tea, relax, reflect, enjoy. Drink plenty of water, floating is a full body experience. Notice how well you sleep the next few nights and how your energy level and mood is, floating is good for you even when you’re out of the tank. Float tanks provide a sound and light proof environment for the user to float effortlessly in a meditative state provided by 1,000 pounds of Epsom salt in ten inches of water. The absolute best float experience for everyone.